Did you catch Pixar’s latest release, Inside Out, this weekend? Are you already trying to figure out the emotions inside your head? The story & characters of Inside Out have taken people by surprise around the world. We bring you a few behind-the-scene facts of the film. Psst! Read till the end for a surprise. The movie is based on an idea director Pete Doctor had after he saw his own daughter, Ellie go through mood swings while growing up. He thought, “What’s going on in her head?”Added to this was his observation about the various quirky things that people do. Neuroscientists were consulted to make the film’s setting of an 11 year old girl’s brain believable. The team also interviewed child psychologists & psychiatrists, spent months designing & re-designing set elements, and even swapped out a key character. The film’s creators also looked at their daughters and their friends for inspiration. According to Doctor, “People think we make this stuff up. Most is real life!” Coincidentally, director Pete Doctor was an animator on Epcot’s former attraction, Cranium Command. The theatre presentation also explored the inside of a person’s head and personified different parts of the human body, such as the left and the right brain. The film’s soundtrack was composed by Michael Giacchino. This is his 5th collaboration with Pixar. He previously worked on The Incredibles, Ratatouille, UP, and Cars 2. Inside Out took 5 years to complete. Pete Doctor pitched the idea to John Lasseter in June 2009. Inside Out has been more editing dependent than almost any other film Doctor has worked on, largely because it’s an ensemble comedy. The film’s animation style took inspiration from classic cartoons and creators like Chuck Jones, Tex Avery, Milt Kahl, and John Sibley. Approximately 177,096 storyboards were drawn for the film. Of those, 127,781 were delivered to Editorial. Each emotion’s design was based on a shape. Joy is a star, Sadness is a teardrop, Fear is a raw nerve, Anger is a fire brick, and Disgust is a broccoli. In an attempt to better represent what emotions would look like animators tried to make the characters appear as though they were composed of energy and moving particles. If you paid attention when the emotions moved, you would have seen them release tiny particles of colours. According to Pete Doctor, the most difficult challenge when directing this film, was creating a completely new and made up world. It wasn’t something they could go out and find a reference for in real life, like a toy store or a university or even Scotland. For each second of the film, 24 images of over 2 million pixels each are rendered. It has a running time of 102 minutes. That means 146880 images. And we’re not even going to count the pixels! Inside Out is the second Pixar film to have a female protagonist, the first being Brave. 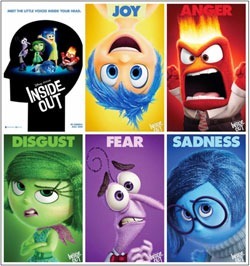 Inside Out is the fourth Pixar film with a PG rating, following the footsteps of The Incredibles, Up, and The Brave. Pixar’s inner team of creative leaders is called Brain Trust. Now time for the surprise! Learn how to make Joy. Just watch the video below & get sketching. Learn all about character design through a professional course . The right guidance will help you make your creative dream come true.